Having responsibilities and opportunities to achieve tasks gives them (and us) confidence and increases self-worth. Many dogs excel at their official (and unofficial) duties, and become fixtures in companies and retail businesses. Interacting with dogs can lower your stress level and blood pressure, while increasing foot traffic and revenues. The next time you’re strolling down world-famous Worth Avenue in Palm Beach, make a little detour into the Gucci Courtyard. 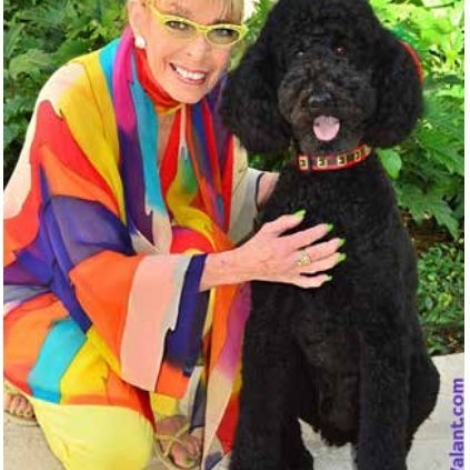 Venture over to Sherry Frankel’s Melangerie, where you’re more than likely to encounter Dash, an exuberant, four year old standard poodle. I affectionately refer to him as “Black Alf” (remember the sitcom about the alien, Alf?). Black standard poodles are longstanding tradition at this magical emporium of fun. First there was Magic, then Jolly; now Dash is Sherry’s main man at home and work. He was named Dash for having a dash of Magic, and a dash of Jolly; biologically, Magic and Jolly were Dash’s great uncles. This affable canine started to accompany Sherry to work at just under four months old. Then, it seemed he would never grow into his large crate, but his joy for life and calm disposition make him the perfect employee. As big as he is, Dash is sure of himself and cautious inside the store. Groomed to perfection, often with his signature feather, he’s a very good investment, working in exchange for room, board, and lots of chinscratches. “Dash’s responsibilities include greeting customers (and delivery people), quality control, entertaining children, and distracting spouses so their wives can shop longer”, states Sherry, proprietor of the small shop for over thirty years. “When he is caught up on duties, he enjoys gazing out his big screen TV (aka front window), napping, leaving and reading “pee-mail” (in the courtyard),” she added. Having Dash at work is instant stress relief. He provides great company, while adding to the warm-fuzziness of the store, which specializes in elegant custommade ceramics, custom embroidered items and whimsical gifts. So, when you’re having an off day, or need a break, look for a business or store with a friendly dog to greet you. 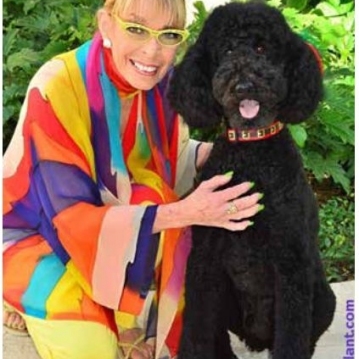 And if you get over to Palm Beach, visit Sherry and Dash - tell them Tina sent you (and give Dash a hug for me)!